Together with her husband Cort, Katelyn Pincock paid off nearly $60,000 in student loans, credit card debt, medical bills and more — in just one year. 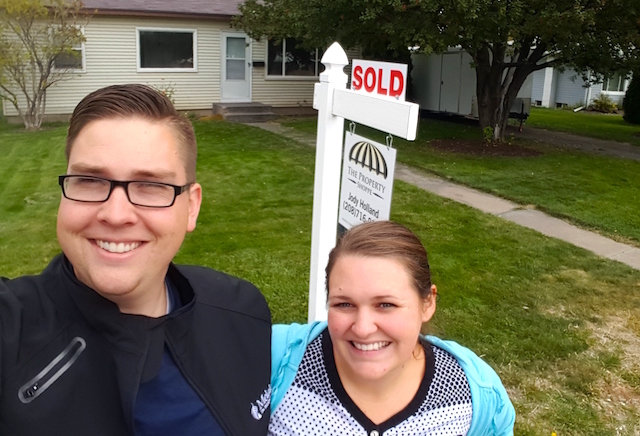 I spoke with the mother of two the week they made their final debt payment, as the family was moving into their new house in Idaho Falls, Idaho. Cort and Katelyn Pincock paid off nearly $60,000 in student loans, credit card debt, medical bills and more in just one year. As a wedding gift five years ago, the couple received a book by Dave Ramsey, and about two years ago began listening to the finance guru’s podcast. The lessons they were learning gave them the push they needed to take their finances seriously. The two were sitting on substantial debt. Each was still paying off student loans. They shared credit card and medical debt from the birth of their children. And they needed to repay a family member for a $10,000 loan. In September 2015, the couple set a goal to be debt-free (except for their mortgage) within a year. Twelve months later, in September 2016, they had paid down $60,000 in debt. “My husband, he actually was working three jobs the last year,” Katelyn explains. Cort was working full-time for a health and wellness company when they set their debt-free goal. Throughout the year, he worked about 20 hours a week overtime for a total $42,000 annual salary. Around the same time they set their goal, he took a second job teaching math and science at a local community college. He taught three nights a week from 7 to 9 p.m. and made around $400 a month. In addition to teaching, he sometimes tutored after hours at the college, plus tutored kids independently at home for an hour or two a couple days a week. The independent tutoring brought in another $150 a month. Over the summer of 2016, Cort landed a new job with a significant pay increase — more than $1,600 a month. The bump brought them to a $62,000 annual salary and gave their debt pay-off a nice boost in its final weeks. But the couple didn’t rely on his income alone to achieve their goal. Cort’s two side gigs may seem like a lot already, but that’s just the beginning. Cort and Katelyn Pinnock hold their HealthyWage checks. “We’ve been doing Amazon for a few years, but we kind of upped it when we started paying off debt,” Katelyn says. They buy items like game systems and textbooks to resell through Fulfillment by Amazon. They were bringing in an extra $200 a month through FBA, but have slowed significantly during their move. 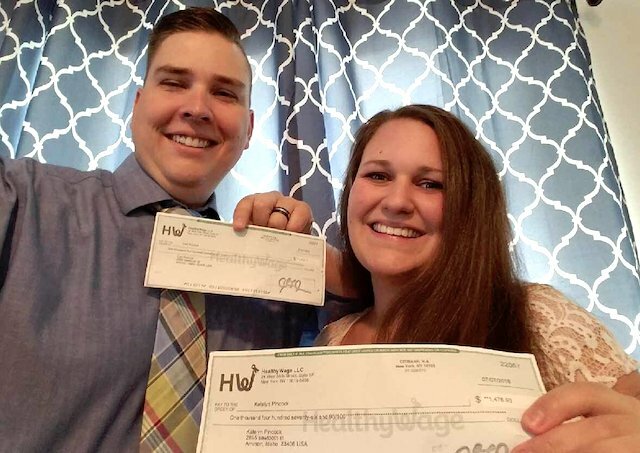 In search of even more creative ways to make money, the couple learned about HealthyWage from The Penny Hoarder (thanks for reading!). HealthyWage lets users bet on their own weight loss to gain motivation to achieve a goal weight — and win money when they do. Katelyn and Cort each bet $75 per month for six months — she wanted to lose 40 pounds, while he wanted to lose 60. Both reached their goals, landing another $3,000 to put toward their family’s debt. Katelyn considers herself, above all, a stay-at-home mom. But the title is deceiving. While she doesn’t work full time, this mom has found plenty of lucrative ways to fill her time. “You know, it’s just crazy what money is out there if you’re willing to (work for it),” she says. She’s a painter and a crafter, and has found some creative ways to make money from her skills. She paints commissioned murals for individuals and creates promotional art for businesses. One of Katelyn Pincock’s holiday window paintings. For example, her main client right now is a local A&W. 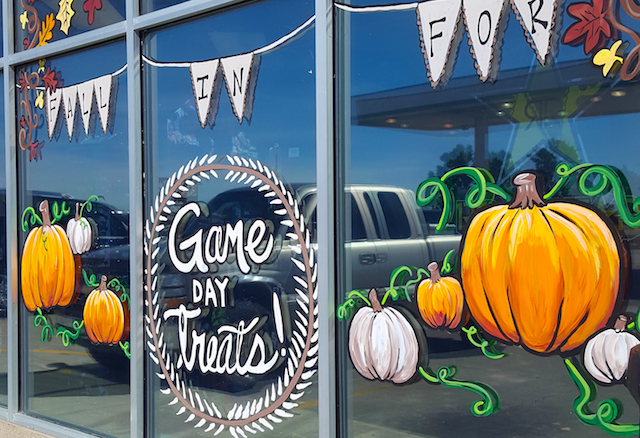 Every few months, she paints a promotion on the fast food restaurant’s window, “like a huge root beer and fries.” Over the holidays, she’ll decorate the windows with Santa and snowmen. Katelyn also sells her creations at local farmers markets — her most popular items are magic wands! 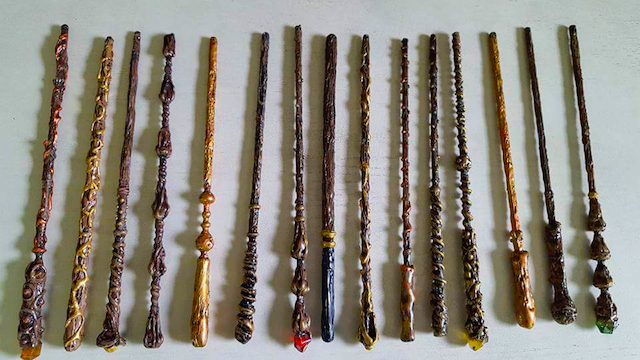 Katelyn Pincock’s handmade magic wands. She sells the wands to kids at the farmers markets and on Etsy for $20 apiece. She’s working on a contract with a local gas station convenience store to sell them there, as well. She’s excited to see the business grow, particularly since debt repayment is off their plate, freeing her to think about putting money into promotion. It’s been growing pretty well through word-of-mouth already — from about $1,000 in sales her first year to $5,000 so far this year. The business only costs her about $100 a month, which covers materials and occasional fees to sell at a market. “It’s funny, I’ve made more doing that this year than I did working part time all of last year,” Katelyn recalls of the two days a week she’d work retail. She’s earning more money and putting in far fewer hours selling her artwork. The Pincocks’ kids are 1 and 2 years old now. Katelyn has them at home full time, save for a couple days a month if she’s painting for a business. Other than that, she gets her work done during naptime. With his busy schedule, Cort is out the door by 6 a.m. most mornings and not home until after 7 p.m. — 9 p.m. if he’s tutoring. To manage time and save money over the past year, Katelyn worked through their food storage to cut back on the grocery bill. They cut back some on shopping, opting for consignment stores for clothes instead of the mall. Katelyn says they’ll probably stick with the habit, even now that their debt is paid off. “I don’t feel like my life has suffered from not shopping at the mall,” she says. Tightening their budget made room for even more money to put toward paying down their debt. 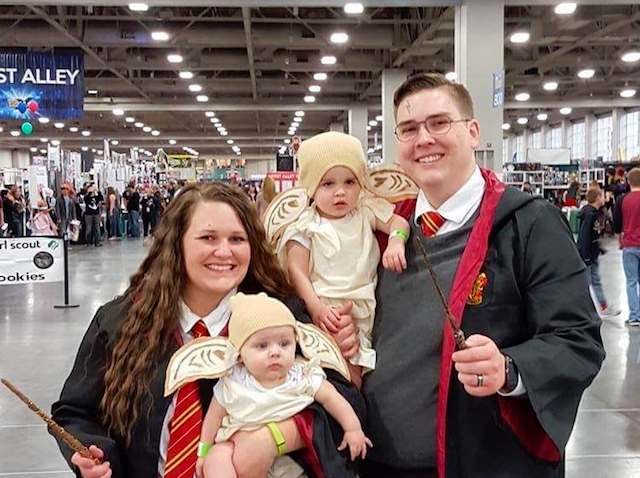 With the sale of their house, the Pincocks were able to pay off their $10,000 personal loan and a remaining $4,000 in student loan debt. They reached their goal in September 2016. Out from under massive debt, this family is not slowing down. They bought the new house for the family, and also have enough saved to make a down payment on an investment property. Their goal is to make enough extra income to cover their mortgage, plus an extra $300 a month per rental property as they grow yet another business together. They plan to do the same with their new house. I asked Katelyn if they’re taking a break to catch their breath after working so hard for a year to achieve their major financial milestone. In short, they continue to look forward. We’re excited to see what they can achieve in another year! Your Turn: How have you paid down a large amount of debt?